What drones can the Zenmuse XT2 be mounted on to? The XT2 can be mounted onto any M200 Series and M200 Series V2 drone as well as the Matrice 600 Pro. Please note that the XT2 will lack certain intelligent features like Heat Track and Quick Track when flown on a Matrice 600 Pro drone. Can the lenses of the Zenmuse XT2 cameras be replaced? 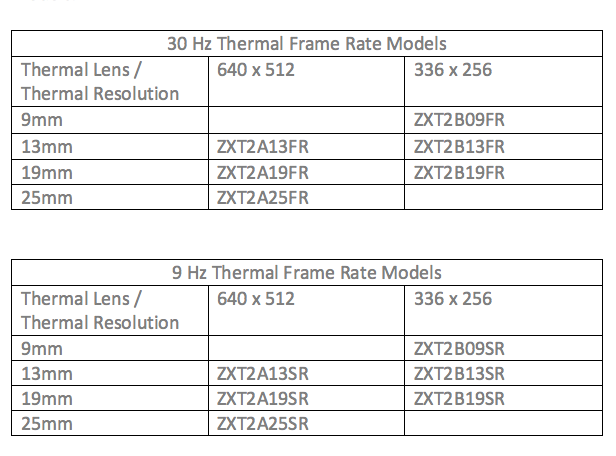 The lenses of the XT2 thermal and visual cameras cannot be replaced, and therefore we recommend consulting with our network of DJI Enterprise resellers to determine which lens best suits your needs before purchasing. What options do I have when purchasing a Zenmuse XT2 camera? How does the Zenmuse XT2 store data? Which file formats? Due to the XT2’s dual sensor design, DJI built in two SD card slots. One stores typical photo and video formats while the other is reserved for thermal video data, which stores the full radiometric data from FLIR’s thermal sensor, enabling a variety of post-processing workflows. You can adjust the type of file stored for each category through the camera settings section of the DJI Pilot app. How long will the flight time of the M200 Series and M600 Pro drones be when flying the Zenmuse XT2? The flight time will adjust based on a wide range of environmental factors. To help you estimate your flight times, we have provided reference figures of max flight times when flying in optimal conditions. What are the improvements on the Zenmuse XT2 compared with the XT? 1. Besides MOV and MP4, the XT2 now allows video formats in TIFF SEQ and SEQ. Additionally, this feature allows much more post production space and temperature analysis from videos. 2. With an added visual camera, you can now record visual and thermal images at the same time. 3. Additionally, because of the dual camera, you can also overlay visual images on top of thermal images simultaneously. What kind of uses or scenarios can the Zenmuse XT2 be applied to? In addition to geothermal detection, fire protection, and forest inspections, the Zenmuse XT2 can also be used for electrical inspections, oil and gas inspections, as well as building inspections etc. Where can I purchase the Zenmuse XT2 thermal camera? You can check for local dealers on https://www.dji.com/where-to-buy/dealer-maps or send a request to enterprise@dji.com. Can the Zenmuse XT2 detect the highest and lowest temperature points at the same time? Yes. All XT2 models are able to detect the highest and lowest temperature points. The XT2 is also able to detect temperatures at any point on the screen, including high temperature alerts. How do I record videos in TIFF SEQ and SEQ formats? To record RAW videos in TIFF SEQ and SEQ formats, insert both Micro-SD card in the slots and RAW videos will be stored in Micro-SD card 2, otherwise you can only insert the Micro-SD card in slot 1. Keep in mind that the XT2 supports SD cards with storage spaces of up to 128GB and reaches UHS-3 level or above. What are the advantages for SEQ and TIFF SEQ video formats compared to MOV or MP4? SEQ (RAW) format allows users to do post production on the videos, such as adjusting color settings or editing the video on each frame. What apps are compatible with the Zenmuse XT2? Currently, the Zenmuse XT2 can only be used on the DJI Pilot App with the M200 Series and M600 Pro drones. Can the Zenmuse XT2 thermal camera be fitted with a lens filter? No. The Zenmuse XT2 lens is integrated with the original lens module and it does not support a lens filter. Does the Zenmuse XT2 come with a Micro-SD card? Yes. There are two 32GB Micro-SD cards in the pack. What if the object's profile is not aligned with the thermal image? You can use MSX Offset in the DJI Pilot App to adjust the alignment. This is an exclusive image format from FLIR. It contains temperature information in each pixel and can be analyzed by FLIR Tools. RJPEG images can also be viewed and processed as with JPEG images. Why does the content of RJPEG images on the Zenmuse XT2 appear colorful whereas those in the XT1 are in black and white? The XT2 has a more powerful processing module than the XT1 hence colors of the thermal images appear to have more detail and better sharpness when showing different temperatures. Can the Zenmuse XT2 record videos in 4K format? The visual lens supports 4K video recording however the thermal lens does not. What factors can affect the accuracy of temperature detection? 1. The reflection of objects on metal surfaces will result in lower temperature detection than the true value. 2. The background temperature will also affect temperature detection. It will be minor in clear weather conditions but greater in cloudy or cold weather. 3.The humidity and temperature of the air. 4.The thickness of the air; thicker air results in less accurate detection results. How many variations of the thermal and visual lens are available? The Zenmuse XT2 has a focal length of 9mm, 13mm, 19mm and 25mm thermal lens. Each of them is equipped with an 8mm visual lens. How may working frequencies does the Zenmuse XT2 thermal lens have? There are two kinds of working frequencies of the lens; 9Hz and 30Hz. Do all the Zenmuse XT2 cameras have Regional Temperature Detection? What do the following characters mean on the Zenmuse XT2 camera model? To help you understand the character references, we will use the ZXT2A19SR model as an example: 1. ZXT2: refers to the Zenmuse XT 2. 2. A: refers to a lens with a resolution of 640*512. B: refers to a lens with a resolution of 336*256. 3. 19: refers to a lens with a 19mm focal length. 4. S: indicates a lens with 9Hz working frequency. 5. R: refers regional temperature detection." What is the difference between High Gain and Low Gain mode? The Zenmuse XT2 will be more sensitive to temperature difference in High Gain mode, but can only work within a narrow temperature range. Similarly, the opposite takes effect in Low Gain mode. In High Gain mode: 1. The detectable temperature range with a resolution of 640*512 is as follows: -25℃ to +135℃; 2. The detectable range with a resolution of 336*256 is as follows: -25℃ to +100℃; In Low Gain mode: All lenses can detect temperature from -40℃ to +550℃. What is the "Side by Side" option in PIP Setting?	" This option will split the video downlink into two parts; one is for the thermal view, and the other is for the visual view. The thermal part will be kept as the original size whereas the visual part is resized and then displayed accordingly. What's new on the XT2's photographic function? Burst Shooting mode has been added. What is the purpose of the low, medium and high options for the MSX level? They represent three different levels of sharpness of the object's profile and pattern. When the MSX level is set to low, the object's profile and pattern will appear less visible. FFC stands for Flat-Field Calibration. It enables the image scene to be clear for observing the temperature variation. The FFC can be turned off in the settings menu and triggered manually. What are the new features and functions on the Zenmuse XT2? Heat Track: Tap on the Heat Track button and the XT2 will start tracking the hottest point in live view. Spotlight: With this feature, the XT2 can track an object based on visible light. PIP function: the live view function can be split into two parts (thermal and visible) and the thermal image can also be integrated at the center of the visual image. How do I upgrade the Zenmuse XT2 firmware? You can download the latest XT2 firmware on the DJI official website and store it into a formatted Micro-SD card. Insert the Micro-SD card into any one of the card slots of the XT2 camera, and then mount the camera onto the M200 or M600 Pro drone. Then power on the drone to start the upgrade. Please refer to Tutorial Videos for more details.